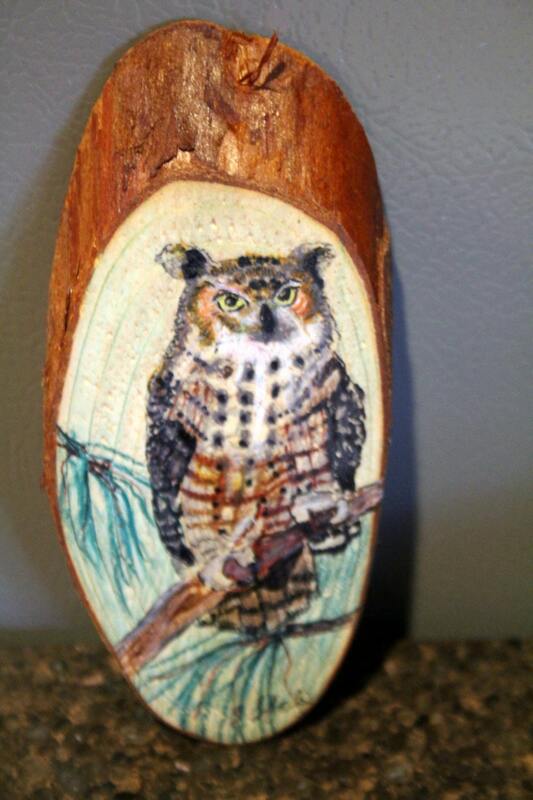 This is a small painting of a great horned owl done on a cedar wood slice cut on the diagonal with a combination of Prismacolor and acrylic. The wood is kiln dried and the painting is sealed with acrylic varnish to protect it. This little portrait can be hung on the wall with a saw tooth hanger or with a leather tie so it can be hung on a nail or as an ornament. The slice is almost 7" long and is lightweight. Please use the notes to tell me how you want to hang it and I will customize it for you. This is a hand crafted, made in Montana piece of art. Note: Shipping to anywhere besides USA will require special postage rates so the $5.99 does not apply. I will have to recalculate the amount before payment is accepted, so please send me a message.